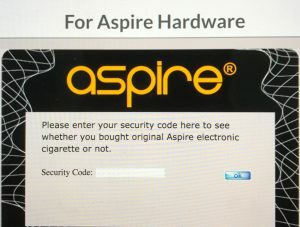 Aspire Vape Co. released an official statement on their website today claiming that roughly 10% (exact number unknown) of “Aspire” products sold in retail stores are actually fake. They attribute this to a rogue distributor who is mixing fakes in with the real ones to help lower costs. As of recently a new investigation has taken place, we are piecing the puzzle together with the help of the community to locate which distributor(s) are responsible. So how do fakes get into the market? Aspire works with different partners such as us (Aspire Vape Co) who accommodate different countries, each with slightly different roles. However when a partner sells to other distributors, a corrupt distributor may use an authentic to produce many thousand fake ones, then the fake batches get mixed with real ones that eventually flood into retail stores. The problem can be hard to locate because for every 10 real tanks for example 1 will be a fake one. Then when a retail shop sells 10 tanks to different consumers, only one comes back with issues. Eventually retail shops deny it and claiming that the user damaged the product because the other 9 he/she sold never had issues. What’s in it for the corrupt distributor? Why sell fakes? By blending a small portion of fakes in with real ones, a corrupt distributor can drop the price per tank by a small portion. However when a retail shop buys large amounts of product, a small portion saved on each piece will add up to become a big amount of money. Aside from the extra profit, the corrupt distributor also saves money by being able to sell products quickly at an attractive price. Therefore they are able liquidate Inventory to money to avoid having cash tied into inventory for long periods of time. There are 3 points of information on every one of our products and 1 source of verification on our website. 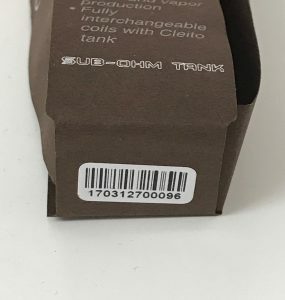 As an example I will use a Cleito EXO packaging paper as an example. In this image you will see a Bar code with the SKU numbers underneath it. Underneath that you will find a scratch bar. In this example the box has been scratched and reveals a 20 digit Product ID number. After the search is submitted you will be told if it is a fake or not, but more importantly it will tell you how many times that ID number has been searched, and that is very important. Since corrupt distributors will buy an authentic one to reproduce fake ones, often times the search result will say authentic, but it will also bring up multiple searches on the ID number. If this is the case we want you to take pictures of your packaging including an additional SKU number which is called the “Distributors SKU” it is often smaller and will be underneath the package as you will see below. With this information we can pin down the distribution that this product was given to then we can eventually find out who made a fake version. We will also use the location of where it was bought so we can ask which distributor they purchased it from. With the help of the community we can put an end to this, I want to thank everyone that has gone to our website and submitted the ID number. This is not just an issue in our company, but it is an issue industry wide. As a vape community we can come together to ensure the best experience for everyone. No one deserves to pay premium price for a fake product. Thank you. If you’re using an Aspire tank or mod (let’s be real, almost everyone has at least one), it’s definitely worthwhile to find out if it’s actually genuine. If you’re about to buy a product and the price seems a little bit too cheap, you should probably pass on the deal. As always, if it seems too good to be true it probably is. Have you bought one of these fake products? Let us know your experiences in the comment section below! 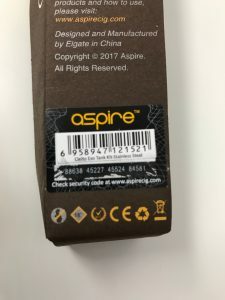 Was Your Aspire Product Genuine? No mine turned out to be a fake.